Ok it’s the weekend and you’ve had all week to talk yourself in and out of joining me for a Spring detox. So what’s it to be? It’s only two weeks or 14 days or however you want to look at it. In the greater scheme of the timeline of your life it’s a blip. However it could be a very important blip. It could go from being a blip to being a life changing experience. You might find a few more fruits and vegetables you like to eat. Maybe you find that eating no grains at all really makes your body happy. You could make new friends while talking about the detox on The WHOLE Gang Facebook page or reinforce a current relationship by pairing up to do it together. The possibilities are endless. So let’s make the commitment together. 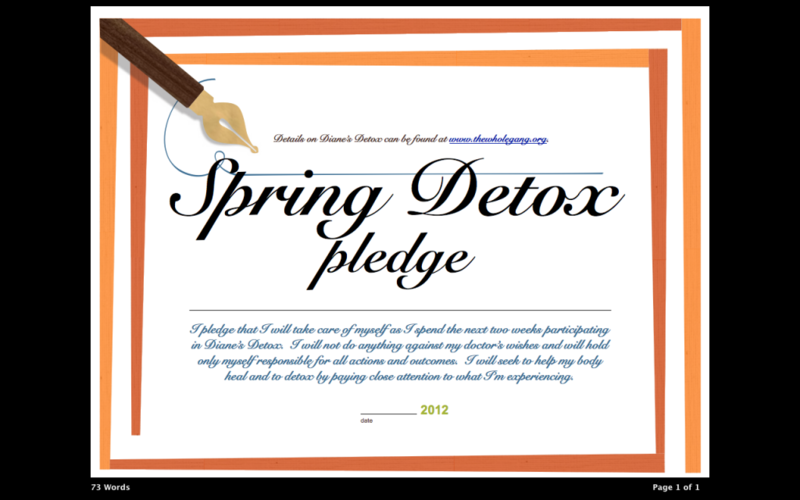 Print this detox pledge out and sign it, post it on your frig, bulletin board, Pinterest Board or your dog. Somewhere you’ll see it everyday. Please read the disclaimer at bottom. Now if you’re a sharing person, grab this badge below and post it on your Facebook or website. Let people know you are working on your health and encourage others to do the same. One little change is what leads to the next little change and before you know it you turn around and see how many great things you are doing for your health. Make sure you visit The WHOLE Gang Facebook page for additional tips and encouragement along the way. We’re in this together! Click here to grab the badge! Let’s get to your Weekend Prep for Diane’s Detox. There are two main things I would recommend you do in preparation for the next two weeks. 1. Plan out what you want to eat and then make sure you have it in stock. 2. Clear out, hide, give away what you are going to avoid for the next two weeks. OK so let’s start with step number 1. Grab your calendar and see what you have planned for these next two weeks. Are there events that include food outside your home like business meetings, parent teacher gathering, birthday party at the office or anything that might come up on the spur of the moment like your office mates invite you out to lunch. If you plan for how you will handle these events, then you will be prepared with your response to their questions or you’ll know what you’re going to eat. Note anytime you won’t be making your own foods or know exactly what you are eating. 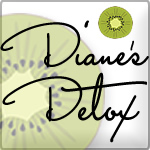 Look at the list for Diane’s Detox and see what you will be working towards. Are you going for the whole list or maybe this is your very first detox so you’re going to pick a few. It’s totally up to you. For instance if you already live gluten free you may want to try eating no grains at all. Whatever you are going to include in your detox keep that front and center. Now I like to make a list of all the foods and drinks I will be eating for the next two weeks. I always like to focus on the postive and what I can control. A good list already available is the Primal Blueprint Shopping List. On that page you can find a listing and a link to a pdf of that list. If you are not familiar with Mark Sission he is the creator of the Primal Blueprint which is his version of a Paleo Diet. I’m not here today to talk about this diet, but I do like his pdf list of foods. Something I need to make for myself with foods I like to eat. I took this list and crossed off anything with dairy as the list is already gluten free. I underlined any foods I either don’t like yet or have not tried yet. The rest of the foods left were fair game for my quick menu. As this goes on I may try some of the new foods or the ones I don’t like yet. I find it’s so much easier to look at a list of what I can eat and go from them when planning a menu. I took this list and checked out what was in my refrigerator and freezer. Was there anything from the list that I could use as a starter for my menu. Yep, lots of frozen organic meats and wild caught seafood in my freezer so I was set. I however was low on fruits and vegetables so I need to stock up on those after I create the menu. So what’s a gal to actually eat on this detox? 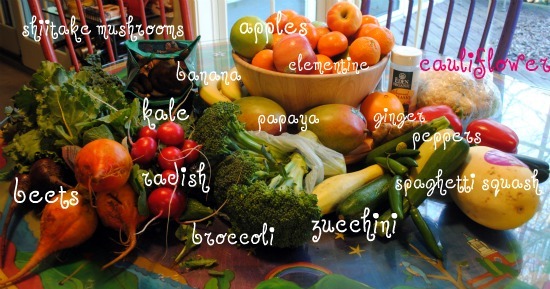 Lots of fresh veggies, fruits, some nuts and seeds along with lean proteins. It’s really easy to keep myself satisfied while doing this as long as I pay attention to what my body is telling me. Make sure you take the time to listen to your body. If you feel hungry, wait a little and see if it stays or did it pass. If it passed you may have been bored, tired or maybe distracted. If it stays than your body is really hungry and you should feed it. During the next couple of weeks I’ll share recipes and menu plans that we will be eating around my house. One thing you can count on is big plates of amazing salads. Here’s my tip to make this super easy. Go shopping and grab a bunch of veggies you’ll want in your salads and then do a little prep. I bought one of the plastic rectangular containers of Organic Power Greens. It had baby spinach, baby kale and baby chard and is a great salad base. I’m totally recycling that container and making it into my salad bar. I’ll prep my ingredients and put them into zip plastic bags and put them all into that container. Then all I need to do is grab my new container of greens and then my new salad bar with all the fixings. I keep the tomatoes on the countertop as you shouldn’t refrigerate those. I won’t use many of these in my salads but with a large variety no two salads will be exactly alike. I also like to have a can of Pole Caught American Tuna on hand to toss some of that in my salad one day. So what’s in your salad bar? I’ll warn you once you give this a try you’ll make a new salad bar every week and you’ll never look back. You’ll never head to one of those weigh your salad, salad bars and spend a fortune on something that you can make at home. equal parts good quality organic oil like olive, avocado or a nut oil to a vinegar or lemon juice. Vinegars can be something like champagne, red wine, balsamic, Ume Plum or whatever is your favorite. Add the ingredients to a mason jar or one of your cleaned out jars from something you purchased, put the lid on and shake. Oh when I say shake it I mean shake it. Put your hips and back into it. Have fun, play a little music and shake it up. Shake it until it’s all one color. Now you can pour it onto your plated salad or over your salad in a bowl and toss it around so it touches all of the salad which is how I like it. Almost forget the clear out which was number 2! This is the easiest part unless your house is your food trap. Grab those chocolate bars, bags of sugar and anything on that list of what you don’t want to eat for these two weeks and bag it up. Put it in another room, give it to a family member to hide or whatever works for you. For me out of sight out of mind. I put it down in the basement in a bag because that’s too much effort to go grab it for a quick thoughtless pop into my mouth without thinking before I realize I ate way too many. I would have to make an extra effort to go and get it which gives my brain time to make another choice. So are you ready! Make a menu, go shopping so you have those ingredients on hand and prep your salad bar. You’re setting yourself up for success! The assistance provided by The W.H.O.L.E. Gang is for informational purposes only. Neither The W.H.O.L.E. Gang nor Diane Eblin is a licensed registered nurse. Any information shared by us is not intended to substitute medical advice from a licensed health care professional. The W.H.O.L.E. Gang makes every attempt to provide accurate information on gluten free foods and lifestyle. However, neither The W.H.O.L.E. Gang, nor Diane Eblin assume any legal liability for the accuracy, completeness or usefulness of the information provided or make any warranty that the advice or information offered will result in improvement of your health or well-being. You agree that you will not under any circumstances disregard any professional medical advice or delay in seeking such advice in reliance on any Content provided on or through the The W.H.O.L.E. Gang and Diane Eblin. Reliance on any such Content is solely at your own risk. We highly recommend that you always carefully read labels before using or consuming any food product, supplement or medicine and consult with your own physician or medical advisor on any matter relating to your health and well-being or any medical condition you may have. The W.H.O.L.E. Gang and Diane Eblin expressly disclaim all liability arising out of the use by you of any information provided. Diane, count me in! I have been wanting to do a detox for some time, but have been clueless where to start. Most of the ones I have found on line I thought to be too brash. I have plenty of fresh greens. Am wondering, I have a large garden each year and have many greens in the freezer. Does it matter whether they are fresh or frozen? … also, juicing greens good with this detox as well? Take it one step at a time. You have to appreciate yourself and what you will do for yourself. i'm in. starting the first day of spring. tomorrow. thanks for the help. I was just going to start making GF bread foor my family…they are bread lovers so this is a real challenge to get something GF they will enjoy. I agree that going grain free is beneficial. I've done it but for only a few days at a time. Maybe the bread can wait while I munch on the delicious recipes you have.